Roero is a hilly region north-west of the town of Alba, lying across the river from the Langhe area. These vines were grown on siliceous limestone soil. 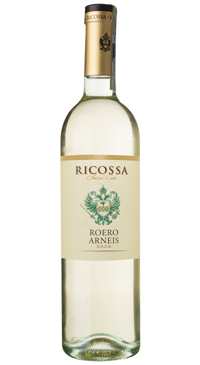 Ricossa has a family tradition is spirits and winemaking dating back to the 1800s. Today, the Ricossa story continues with MGM Mondo del Vino, opening itself to the world with a living and dynamic reality, all the while keeping the old values upon which their business grew. MGM Mondo del Vino, brings the authenticity and quality of Piedmontese wine to wine glasses of the world. Expect incredible value and quality. Straw yellow colour with a fresh bouquet of pear, green apple and wild flowers. A fresh, floral style, with crisp apple fruit rounded out by notes of pear and apricot. Dry but generous in texture, this is a delightful, characteristic example of a local grape variety.